As the days lengthen thoughts of balls running through hoops will be entering some of our minds again. Tim Rhodes has spiked and applied lawn sand to the Fowey Hotel's lower tea-garden lawn and later he will apply moss killer followed by rolling and seeding the patches which are resistant to grass growth. By the summer we should have an improved area for croquet. Weather permitting, mid-April will see the start of our 2007 season. The Committee has suggested that we run a series of coaching and general encouragement lessons for less experienced players on the second Monday of each month, commencing in May (except August). We hope that these sessions, taken by experienced players, will instil confidence and encourage them to play in friendly home Club games. 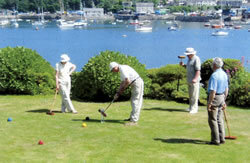 The lower tea-garden lawn at the Fowey Hotel is certainly one of the most scenic places to play as is shown in the photograph! A prompt start at 2pm is planned, so please arrive by 1.45pm and help us to set up the lawn. Prompt arrival, because of numbers, will enable those tutoring to plan the afternoon. After play you might like to have a cup of tea on the higher tea- garden lawn. Away v Budleigh Salterton: to be arranged. The matches will generally start at 10.00/10.30am and continue until 4.00/4.30 pm with a break for a picnic lunch. It will be very encouraging for the players to have some supporters, particularly, when we play at Porthpean. There is always a good tea after these matches, so if you come to watch during the afternoon, please bring a small edible contribution and join in the party. Members who attended the Safari Night and the Christmas Party will, no doubt, remember how enjoyable these two evenings were and ouf thanks go to Janet and Sylvia, our Social Secretaries, for organising the events. On both occasions Rosemary, our Chairman, very kindly provided pre-party drinks. Thank you, this kind gesture did get the evening off to a flying start! The Safari Night was a new idea and occurring on Harold Eardley's birthday we were able to celebrate the evening with him. Harold generously provided the wine which accompanied a tasty Pumpkin Pie - a gift very much appreciated by all attendees. Delicious desserts were provided by Gwen Cussans who, unfortunately, because of George's illness was unable to attend. The Christmas Party at the Fowey Hotel also went with a festive swing. Again, we were sorry that Sylvia, owing to illness, missed the party. Sylvia has now made a good recovery and she would like to thank members for their get well cards. In February there is a further social event which we hope you will join in - A Valentine Evening Supper at Chuffers, Friday, 16 February 2007. The menu, attached to your printed Newsletter, looks excellent. It would be a good idea to book early for this evening as there are a limited number of seats. Sylvia would like the reply slips, together with your cheque, returned no later than Monday, 5 February 2007. The date for our Annual General Meeting is Tuesday 13 March, 2007 at 2.00pm. Venue: The Library, Fowey. Car parking and lift facilities are available - we do hope to see you there. A complimentary, traditional Croquet Tea of Cucumber Sandwiches followed by Fruit Cake will be provided. Members wishing to propose a resolution should write to the Club Secretary, Marlene Bowden, by Friday, 9 February 2007.